Lady Catherine Ambrose, having had high hopes for a pleasant evening, realized that it was not going to come to pass. Her father, the Earl of Barford, was in a more than usual state of agitation, given that he and his oldest enemy had found themselves attending the same dance. The setting was too large and well attended for the evening to be considered intimate, and too small for the event to be described as a ball. All in all, the term dance would have to suffice. “No, damn you!” The Earl looked furious and responded in a voice that was certainly loud enough to be heard over the music and the chatter of the evening. Philip looked crestfallen and, Catherine realized, a little humiliated. As far as she was concerned, her brother did not deserve to feel either one of those things, and it gave Catherine pain to see it. In the end, Philip just gave a brief, respectful nod and turned away a little, clearly determined to let his father carry on with his vile mood in his own way and without assistance. Being in a vile mood was a lifelong state of being for Oscar Ambrose, and Catherine could not remember a time when he was any different. And that was just his day to day existence; when his bitterest enemy was added into the equation, his mood grew fouler still. Catherine wondered briefly why it was when the animus between the Earl of Barford and the Duke of Shawcross was so widely known, that Lord Vinton had chosen to invite them both to a smaller gathering. The whole thing was as a red rag to a bull where her father was concerned, and she had little doubt that the Duke of Shawcross was similarly affected. But then, Lord Vinton should not really have to dwell on such things; it was down to two grown men to behave better, not down to a whole county to carefully choreograph every social occasion so that the men did not have to stand within a few yards of one another. Catherine liked Lord Vinton. He was a kindly old baron who probably thought the Earl and the Duke should bury the hatchet, and he was welcoming to all who crossed his threshold. His country mansion was neither small nor large, and the room they were in for the food and dancing was too big to be a drawing room and too small to be a ballroom. But Catherine liked it very much. It was a bright room, the wood-paneled walls painted a pale cream, giving it an airy, if not overly spacious, feel. There were tables and chairs set around the outer edges of the hall, and enough good food to keep everybody happy. Catherine’s father had kept to his feet all night, however, as if to sit down would somehow be to give some advantage or other to Penrose Carlton, the Duke. And for his part, it would seem that the Duke of Shawcross was under the same impression, also choosing to stand, with his eldest son looking as if he was trying to placate his father in the same way as Philip had tried to placate theirs. When two of her father’s acquaintances came to join them, Catherine gave a silent sigh of relief. It allowed her to take half a step backward from the group and involve herself in matters of the room without having to concentrate on her father’s conversation. Philip, however, was not so blessed, being drawn into it all and shown off by the father who had, not two minutes before, spoken to him as if he were a child or servant. But Catherine knew she must take what she could get and so looked all around to satisfy her curiosity over who had turned up to the event, who had fallen into conversation, and who, like her, was just satisfying themselves with a good study of everyone else in the room. As she gazed around, Catherine found herself looking right at Thomas Carlton, the Duke’s second son. He appeared to have been scanning the room as she was, and he smiled a little sheepishly when their eyes met. He no doubt thought he had been caught out in his secret observations, but no more than she had, so she smiled back. Catherine was careful to make the smile brief, not because she had any argument with Thomas Carlton, but because she did not want her father to see it. She allowed her eyes to stray to her father and his sycophantic friends and then back to Thomas Carlton. He was still looking at her when she turned back, and Catherine smiled again by instinct. She knew almost nothing about the young man, except what she could see with her eyes, and certainly had no quarrel with him. And he was such a handsome man too, even more so than his older brother. But his older brother was the heir to the Duchy and, whenever she had the luxury of studying that family, Catherine could easily see how Thomas Carlton was of much slimmer consideration to all around them, occupying much the same position in his family as she did in her own. The evening progressed well enough, with more of her father’s acquaintances gathering around him, just as the Duke of Shawcross seemed to be attracting his own small following. It was always the same for men of title, and Catherine stifled a laugh when she ridiculously thought that she was glad she was not a man of title herself. Being Lady Catherine was title enough, and one which gave her no power whatsoever. “Would you do me the honour, my dear Catherine.” Lord Vinton appeared suddenly and with such a warm smile that Catherine could not refuse. “It would be an honour, Sir,” she said with amusing grandeur and was pleased to see Lord Vinton appreciated her gentle humour. They made their way to join the rest of the dancers, lined up with the finely dressed ladies and gentlemen, and respectfully bowed at one another before the dancing finally began. As Catherine made her first turn, she saw Thomas Carlton just two spaces away, dancing with Lord Vinton’s ageing sister, Ariadne. She caught his eye again and, just as before, he smiled at her. She returned his smile before completing her turn and facing away from him. 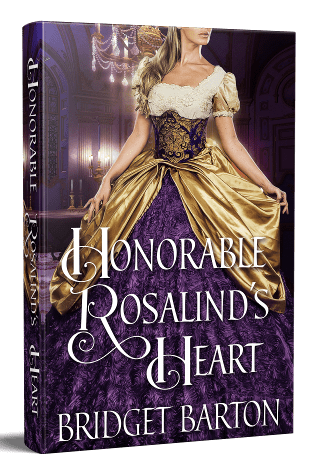 With a show of the vigilance that was a habit with her, Catherine darted a quick look over to her father to be sure he had not seen the tiny smile that he would have viewed as a huge betrayal. Mercifully, Lord Vinton chattered his way happily through the entire dance, taking her mind off her father, and her eyes off the handsome Thomas Carlton. And he really was handsome in a very distinctive way. Thomas Carlton was not a classically appealing man. His hair was more red than brown, and his eyes were not the startling blue of romance novels, nor the dark, inky pools of poetry. Instead, they were the palest blue, the colour of the sky on a day when the sun was so weak it barely shone; the very palest sky blue. His face was handsome in a way many might easily dismiss. It was a clever, knowing face, with angles and furrows, not the symmetrical face of the sort of handsome hero who was, in her opinion, all too prevalent these days. There was something about Thomas Carlton, something almost mesmerising. But it was something that she had determined to ignore or at least only study from afar for the sake of her own curiosity. They certainly could never be friends, so what did it matter if she found him unusual and most pleasing to look at? When the dancing had finished, Catherine returned to her party, joining Philip, who had made his way to the edge of things. “You danced very well, Catherine.” Philip smiled genuinely. “He is a kindly sort of a chap. I like him too.” Philip nodded, his young face so handsome and bright; his features as open as his father’s were closed. “I see we are to stand for the entire evening,” Catherine said with a shrug, looking vaguely towards their father and the men who had surrounded him. “Thank you.” He squeezed her hand briefly. “Oh, for a night where the party might simply be enjoyed for its own sake!” He laughed amiably, but Catherine felt for him all the same. Catherine hurried through the crowd with a fixed, polite smile. She was careful not to make eye contact with anybody, lest she be drawn into some conversation or other and miss the chance to speak to Emily Barton at all. But, despite her best efforts, by the time Catherine had made her way out of the room, Emily was nowhere to be seen. Catherine looked up and down the corridor, wondering if Emily had headed in the direction of the entrance hall to leave, or towards the other end of the house where she might find some way outside for a few minutes’ air. Thinking it too early for Emily to be leaving, Catherine decided upon the second option and headed further along the west corridor. All was quiet, and she listened for any sound of Emily’s footsteps in the distance. But the mansion was so full of sounds that she soon gave up careful listening as an impossible idea and trudged onward. “Are you trying to escape, Lady Catherine?” Catherine gasped and wheeled sharply around to see none other than Thomas Carlton standing behind her. “Oh dear. And I do so want to speak to her about the bridge,” Catherine said, trying to think how she should maintain normal conversation with a young man she was certain she ought to look upon as her enemy if only to be loyal to her own family. “Then I can tell you it is next Wednesday afternoon at one o’clock. I believe Miss Barton will be sending around hasty invites over the next couple of days. In her excitement, I am told she had forgotten to do so before. It has caused a great deal of confusion and excitement, which is apt because a game of bridge always leaves me rather confused and occasionally excited.” He grinned at her, the skin around his pale blue eyes wrinkling pleasingly as he did so. “Oh, are you to attend?” she said, feeling pleased and perturbed all at once. “You may go wherever you choose, Lord Thomas. Please do not think I would see you barred from any event, Sir.” She smiled weakly. He really was such a pleasant young man, and he always had been. Whilst they had never spoken for as long as they were at that moment, whenever their paths had crossed in the past, Thomas Carlton had always acknowledged her politely, no hint of sarcasm or thinly veiled malice. “You are not the only one.” She nodded and laughed also. “Yes, I hope so too,” she said and smiled before turning to hurry back to her family. “I grow tired of Augustus Mortimer and his attempts to ingratiate himself to me.” The Earl of Barford, although clearly speaking to Philip, did not bother to look up from his breakfast plate. Instead, he just kept cutting off great chunks of bacon and stuffing them into his mouth as he spoke. “I cannot abide people who see an acquaintance with me as a pathway to something better for themselves. No doubt this one has his eye on my money. I should have seen it before.” He raised his head finally if only to look at Philip for a moment. “Take heed, boy. Always be on the lookout for the ones in want of a free passage in life.” He looked down at his plate again and continued his indelicate attack upon the breakfast plate. Catherine had all but finished her breakfast when her father had barged into the room. She ordinarily was down so much earlier that she did not often encounter the Earl at the breakfast table, finding she preferred to start the day in that fashion. But whenever he had risen a little earlier, catching her off-guard, Catherine had never dared leave the table before her father did, even on a day such as that one when her breakfast was all but done by the time he strode in. “Yes, Father,” Philip said and was as calm and attentive as always. Despite the fact that the Earl had always paid Philip the attention an heir was bound to get, and her less than nothing, the siblings had always been the greatest of friends. Their father’s unequal treatment of them had never stood in the way of their fond regard for one another. As much as Philip apologised for their father’s neglect of her, Catherine apologised for their father’s overbearing attention to Philip. And so, the two were easily appeased, understanding that they had no control of the man who ruled them and choosing to seek solace in each other’s friendship, rather than bitterness as rivals. As her father continued to eat, making the sort of noises a pig might make, Catherine concentrated hard on sipping her now-cold tea and studying a patch of paintwork in the corner, above one of the large windows, which was peeling. It had been peeling for a while, although it was in a spot seldom looked at, so it was likely that neither her father nor Philip had noticed. And it was so slight as not to mar the otherwise fine decoration of the breakfast room. The room was still clean and bright, its pale green walls and white half-paneling very attractive indeed. It was on the east of Barford Hall, and always got the best of whatever morning sunlight was available. Catherine liked the room; it was a place where she and Philip enjoyed the one meal of the day they could often take alone, giving them the opportunity to talk unguardedly as they ate. Philip did not look at his sister, but his barely perceptible flinch was enough for her to know that he was as appalled by what he was hearing as Catherine. The idea that the Earl could be so childish, giving favour and taking it away so suddenly diminished him even further in her eyes. But she could see how her father’s arrogance and capriciousness had worked in her favour on this particular occasion, for she would not have liked to have found herself unwillingly betrothed to Francis Mortimer; she did not like the man at all. The idea, however, that this was the first indication that such a union had even been a possibility made her feel a little warm and suddenly nauseous. It was proof, if further proof was needed that she meant nothing and was utterly powerless. It reminded her that her life could change so suddenly and without warning, and there would be nothing she could do to stop it. All she could do was blow this way and that on the wind of her father’s plans. “Right,” the Earl said, rising to his feet in an awful scraping of chair against floorboards. “I have some matters to attend to, Philip, and then I shall be setting off to see the attorney. You will come with me; it will do you some good,” he said. “Be ready to leave when I call you.” And with that, the Earl strode out of the room. It occurred briefly to Catherine that her father had yet to even bid her good morning, but she would not mourn the loss of his greeting. She was just relieved to be rid of his presence. “Are you alright, Catherine?” Philip said in a quiet, cautious voice. “Yes. A little shocked, but I shall survive it.” She sipped at her cold tea again to relieve her dry mouth. “Here.” Philip rose and took another cup from the sideboard laden with breakfast items. He poured her a fresh cup of tea from the still-warm pot and set it down in front of her. “Come, let us talk of brighter things.” Philip lightened his tone, but the effort to do so was clear to Catherine. Catherine’s brother was a kind and handsome young man. At two-and-twenty, he was just two years older than she, although she knew his responsibilities to be vaster and very different. She knew that those responsibilities weighed heavily upon him too, for their father was not a man who allowed mistakes or explained a thing more than once before expecting a person to know it all by heart. The strain of it all was something she could often see on Philip’s face, and she felt sure it would age his handsome features prematurely. “Indeed, that is a lesson we have both learned to our cost.” She smiled sadly as she remembered the array of friends whose company the two Ambrose offspring had been systematically disallowed over the years. “Philip!” Their father’s voiced boomed from some distance, still loud enough, however, to make them both start. “And let us hope that breakfast will be a lot freer tomorrow morning.” He gave her the secret little wink he had always given since they were children. It was their way of acknowledging the things they were not always safe to voice aloud, and she winked back, even though she knew it was hardly ladylike. Philip kissed the top of her head as he passed her, disappearing off into the corridor beyond. When she heard no more of his departing footsteps, Catherine resumed her familiar study of the patch of peeling pale green paint above the window. She really had enjoyed the bridge afternoon. Not just because Emily Barton had made such a success of it, but because she had enjoyed her own, subdued excitement there. Ever since her little encounter with the Duke of Shawcross’ son in Lord Vinton’s mansion, Catherine had found herself looking forward to the bridge afternoon, even if she nursed a small amount of fear at the same time. Certain that Thomas Carlton would be there, Catherine had found herself putting a little extra effort into her appearance. Nothing that would be obvious, but something that could be easily explained by the importance of the day for her friend Emily. Catherine had worn a simple, short-sleeved gown in dusky pink. She liked the colour, although most colours suited her given that her hair was a nice, medium brown. She had quite neutral colouring, with creamy skin and hazel eyes that were rather almond shaped. With her brown curls piled neatly onto her head, Catherine had slid a small comb into her hair. It had tiny flowers on it and was delicate rather than ostentatious. Still, she was pleased when Thomas had made a point of complimenting her on the little adornment. “How nice the little flowers look, Lady Catherine.” It had been his opening line to her, and she found herself very pleased to have worn the comb at all. “Thank you, Lord Thomas.” She felt shy and a little afraid. “I see we neither of us have the benefit of family today,” he said in a tone which suggested that such a thing would hardly be a benefit at all. “Good heavens, but that is funny!” she said, parroting his earlier words and pleased to see that he had not only noticed her little game but that he appreciated it. Catherine had hardly been able to concentrate on her bridge playing for the rest of the afternoon and had come away wondering how it was that she had won every game she played. Smiling at the memory, Catherine kept to her seat and stared at the peeling green paint until the maids came tentatively into the room to clear away. “Not at all, My Lady.” Violet, the older of the two young women spoke for them both. “I shall let you have the room; otherwise, I shall stare into space all day.” She smiled at them before leaving, feeling in much greater spirits than she had expected to be just a few minutes before. As she made her way back up to her chamber for a few more minutes in which to think the whole thing through again in private, Catherine knew that it was thoughts of Lord Thomas Carlton which had cheered her so, and there was no denying it. “A Soulmate for the Heartbroken Duke” is an Amazon Best-Selling novel, check it out here! 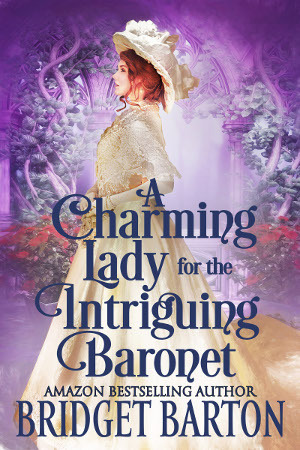 When Lord Thomas Carlton, second son of the Duke of Shawcross, decides one fateful afternoon in his youth to befriend the beautiful Lady Catherine Ambrose, he could never conceive of the events that would follow. Tired of his father’s bullying and arrogance, he thinks he will amuse himself by making a friend of the daughter of the Duke’s bitterest enemy; The Earl of Barford. Little did he know how he would fall in love with Lady Catherine and let loose a chain of events that could seemingly be stopped by nothing and nobody. Lady Catherine Ambrose, daughter of the Earl of Barford, knew what it was to grow up in a household where little was thought of a young woman. Her father was more concerned with his bitter feud with the Duke of Shawcross than the welfare of his offspring. When Thomas Carlton first speaks with her at a summer ball, Catherine thinks him daring and amusing, not to mention handsome. But, within a short space of time, she finds herself hopelessly in love with him. A love that would never, ever fade. When the two are discovered and parted by their families, Catherine finds herself adrift in a world she does not know, a place so far from home. But will she find peace there? And can her new family help her through the most shocking event of her life? And, when all is settled, can the two young lovers finally make their way back to each other and live in the love that should have been theirs all along? 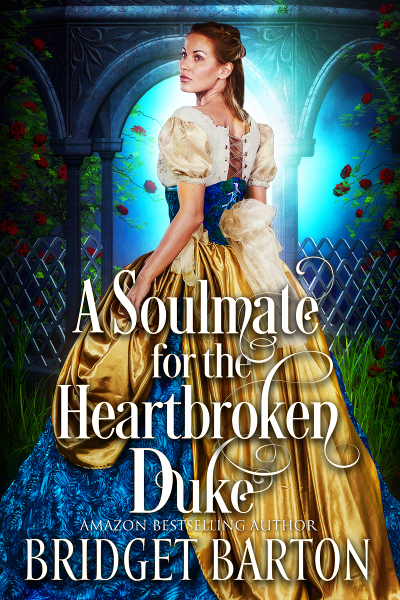 “A Soulmate for the Heartbroken Duke” is a historical romance novel of approximately 80,000 words. No cheating, no cliffhangers, and a guaranteed happily ever after. Thoroughly absorbing – this is going to be a fantastic story. I cannot wait for the rest of A Soulmate For The Heartbroken Duke. What I have read so far was very promising. I hope you are truly feeling better. I was quite worried about you the last few months when your e-mails were so infrequent. Thank you so much, my sweet Meg! So glad you enjoyed it. Few days more left! I humbly wait with great anticipation for this book. I’m completed interested already. Can hardly wait until I can read the whole story. Thank you, my dear Lois! So glad to hear that! Few more days until the official release! That would be the ideal setting, indeed! Glad you like it so far, dear. So far sounds absolutely wonderful! Cannot wait for the book to come out. Thank you, my dear Sharon! So glad you liked it! Few more days until the official release! Excellent beginning. Like the idea of the heroine falling for the second son. Thank you, my dear Sue! Glad to hear that you liked it! Few more days till the book is out! It got me hooked! and I am looking forward to reading their story! thank you for this glimpse and as always, may the Muses be with you for ever! Loved it so far, can’t wait to read the entire book, great writing. Thank you for your kind words, my dear! Few more days until the official release! With what ive read so far it’s going to be another good book. Looking forward to reading the finished book. All Bridget’s book’s ive read have been easy to loose yourself in them. Oh my, I am humbled. Thank you my dear Rosemarie, I appreciate it so much! Cannot wait for the book to come out. Thank you, my dear Rowena! Few more days until the official release! Love the thought of intrigue why are their parents so old and angry? Would like to solve that mystery? Thank you, my dear Katie! So glad to hear that! Book coming soon! The book has a good start and hopefully will be original. I shall read the rest of it. Captures your imagination immediately, I can’t wait to read the rest. Thank you, my dear Anne-Marie! Few more days until the official release! Great book, I have to have the book. Sorry you were ill, happy you are better. Thank you, my sweet Joan. I am feeling much better now! Book is coming out soon, stay tuned! Please keep writing — your stories are wonderful. Can’t wait for this one to be finished! Thank you, my dear Jill! Few more days until the official release! Just the preview, and I’m hooked! An interesting start. Please consider me for an ARC. Thank you, my dear Sandy! So sweet to hear that! Few more days until the official release! It will be a pleasure to continue reading this story. It has the hallmarks of realistic family relationships and the ability to overcome adverse conditions. Excellent points. Thank you my dear Barbara! I enjoyed the review of your new book. Look forward to reading it. Thank you, my dear Ellie! So glad to hear that! Few more days until the official release! Really looking forward to continuing this absorbing story. Looking forward to reading the rest of this book. Thank you, my dear Donna! So glad to hear that! Few more days until the official release! Sounds like an interesting plot; children of enemies getting together. Can’t wait to read the stories twists and turns. Bet there will be some interesting ones! So good ! I can’t wait for the rest of the story. Please put me on the ARC list. I can hardly wait to read the rest is the book. Well written hard to put down. Hope you are feeling better. Keep up the great work. Thank you, my sweet Marilynn! You are so kind. Few more days until the official release! I have enjoyed this book so far, can’t wait for the rest of the book. Thank you, my dear Elizabeth! So glad to hear that! Few more days until the official release! Can’t wait to see how Lord Thomas’ and Lady Catherine’s relationship unfolds! I was engaged the whole time! Excellent! So glad to hear that Gabrielle! Few more days until the official release, dear! Great read so far! I’m excited to read the whole book once it’s been released! Thank you, my dear Deanna! So glad to hear that! Few more days until the official release! Definite looking forward to the book. Wonderful! So glad to hear that! Few more days until the official release, my dear! Looking forward to seeing the book. Ready to finish reading this book. Lete know when available. Absolutely! Few more days until the official release! 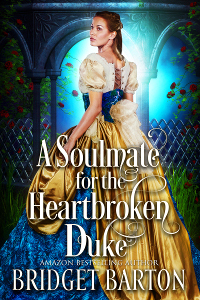 So far I really enjoyed the excerpt of your new book, “Soulmate for the Heartbroken Duke.” I love the way you write and am looking forward to some good twists and turns in the story. Thank you for the glimpse of your new novel. I look forward to reading the full book when published. Hope you are feeling better and recovering quickly so you can continue to provide us wuth more enjoyable reading. This has started as a fascinating story. I like the way the plot seems to be headed, thus I am looking forward to the rest of the story. Besides since it is by Bridget Barton it will be good. I see a couple that is fascinated with each other & the excitement of getting caught by their tyrant father’s makes for intrigue in clandestine secrets. There will be terrible trouble & the siblings will be torn within the family. Can’t wait for the finish. Thank you, my dear Patricia! You are on point! Few more days until the official release! A Soulmate for the Heartbroken Duke.
. Thank you for sending this preview. It’s a great read and I look forward to reading this story! What a gift of words you have. Such simple imagery! I felt as if I was sitting with tepid tea staring up at paint chips! Glad you are back and feeling better! So glad to hear that you liked it! Few more days until the official release! Lovely beginning. I’m eagerly awaiting to read the entire book. Thank you, my dear Usha! So glad to hear that! Few more days until the official release! Sounds like a very good beginning to an interesting book with your usual well defined characters. Keep up your wonderful stories and we are all happy to hear you are feeling better. I can hardly wait to red your new book, I think I have already read most of your books, love your stories, you are a great writer, stay healthy, thank you for the preview, I’m hooked! I love the preview and I can’t wait to read this one. I am loving both main characters already and dreading all the obstacles which are coming their way but I know they will find their way in the end. I am glad you’re doing well and back to writing again. What a great teaser!! I can’t wait to read MORE!! We already know that these two belong together! I’m so glad I’m on your list so I get to read your previews…Looking forward to reading the book and hoping it won’t be too long a wait ! A soulmate for the heartbroken Duke looks like another winner from Bridget Barton! Looking forward to the release. Thank you for another wonderful story. I’m so excited for this book. Can’t wait to read the whole story. So far intriguing and with secrets that I would love to solve in my head while I read. Good job Bridget. I am glad you are feeling better. I hope it was not anything serious. I loved the preview! I cannot wait to read this book. I am so glad I am on your review team and hope to get to review this book. For this I must say thank you. Well I am hooked! Can’t wait to read this story. What self centred egotistical overbearing fathers. Well this story definitely has me hooked not just to find out about the main characters but also Philip, such a nice brother.